High and low annual exceedance probability levels are shown relative to the tidal datums and the geodetic North American Vertical Datum (NAVD88), if available. 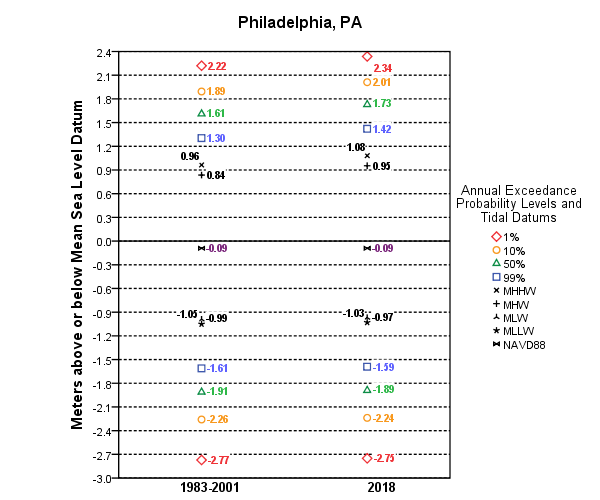 The levels are in meters relative to the National Tidal Datum Epoch (1983-2001) Mean Sea Level datum at most stations or a recent 5-year modified epoch MSL datum at stations with rapid sea level rates in Louisiana, Texas, and Alaska. On the left are the exceedance probability levels for the mid-year of the tidal epoch currently in effect for the station. On the right are projected exceedance probability levels and tidal datums assuming continuation of the linear historic trend. The extreme levels measured by the CO-OPS tide gauges during storms are called storm tides, which are a combination of the astronomical tide, the storm surge, and limited wave setup caused by breaking waves. They do not include wave runup, the movement of water up a slope. Therefore, the 1% annual exceedance probability levels shown on this website do not necessarily correspond to the Base Flood Elevations (BFE) defined by the Federal Emergency Management Administration (FEMA), which are the basis for the National Flood Insurance Program. The 1% annual exceedance probability levels on this website more closely correspond to FEMA's Still Water Flood Elevations (SWEL). The peak levels from tsunamis, which can cause high-frequency fluctuations at some locations, have not been included in this statistical analysis due to their infrequency during the periods of historic record. On average, the 1% level (red) will be exceeded in only one year per century, the 10% level (orange) will be exceeded in ten years per century, and the 50% level (green) will be exceeded in fifty years per century. The 99% level (blue) will be exceeded in all but one year per century, although it could be exceeded more than once in other years. The level of confidence in the exceedance probability decreases with longer return periods. See the exceedance probability curves to get an estimate of their 95% confidence intervals.